May Day has many meanings across the centuries. Perhaps the primary one in the Northern Hemisphere is that you can put the ice scraper in the trunk and hope the gods don’t smote you. This year we have the unusual good fortune to have the first of May on a Sunday with mild weather and sunshine. If that’s not a miracle, I don’t know what is. May Day, when the weather cooperates, celebrates a time of year when Spring reaches even the most frozen, internet-addicted soul. Known as Beltane in the Celtic Wheel of the Year, it is a worker’s holiday in much of the world. May Day stands across the Wheel from another disreputable holiday the Celts bequeathed us–Halloween. It’s a time to test boundaries. May Day will be Occupied this year. Who knows what labor will be up to by Labor Day? Here might be seen the Savage Man, well known in heraldry, hairy as a baboon, and girdled with green leaves. By his side, a noble figure, but still a counterfeit, appeared an Indian hunter, with feathery crest and wampum belt. Many of this strange company wore foolscaps, and had little bells appended to their garments, tinkling with a silvery sound, responsive to the inaudible music of their gleesome spirits. Some youths and maidens were of soberer garb, yet well maintained their places in the irregular throng by the expression of wild revelry upon their features. Such were the colonists of Merry Mount, as they stood in the broad smile of sunset round their venerated Maypole. Had a wanderer, bewildered in the melancholy forest, heard their mirth, and stolen a half-affrighted glance, he might have fancied them the crew of Comus, some already transformed to brutes, some midway between man and beast, and the others rioting in the flow of tipsy jollity that foreran the change. But a band of Puritans, who watched the scene, invisible themselves, compared the masques to those devils and ruined souls with whom their superstition peopled the black wilderness. Within the ring of monsters appeared the two airiest forms that had ever trodden on any more solid footing than a purple and golden cloud. One was a youth in glistening apparel, with a scarf of the rainbow pattern crosswise on his breast. His right hand held a gilded staff, the ensign of high dignity among the revelers, and his left grasped the slender fingers of a fair maiden, not less gayly decorated than himself. Bright roses glowed in contrast with the dark and glossy curls of each, and were scattered round their feet, or had sprung up spontaneously there. Behind this lightsome couple, so close to the Maypole that its boughs shaded his jovial face, stood the figure of an English priest, canonically dressed, yet decked with flowers, in heathen fashion, and wearing a chaplet of the native vine leaves. By the riot of his rolling eye, and the pagan decorations of his holy garb, he seemed the wildest monster there, and the very Comus of the crew. As history tells, the Puritans won. Still, they never quite succeed in pulling all the dandelions out of the lawn. Hawthorne has a lot to say to us today, in this short story. 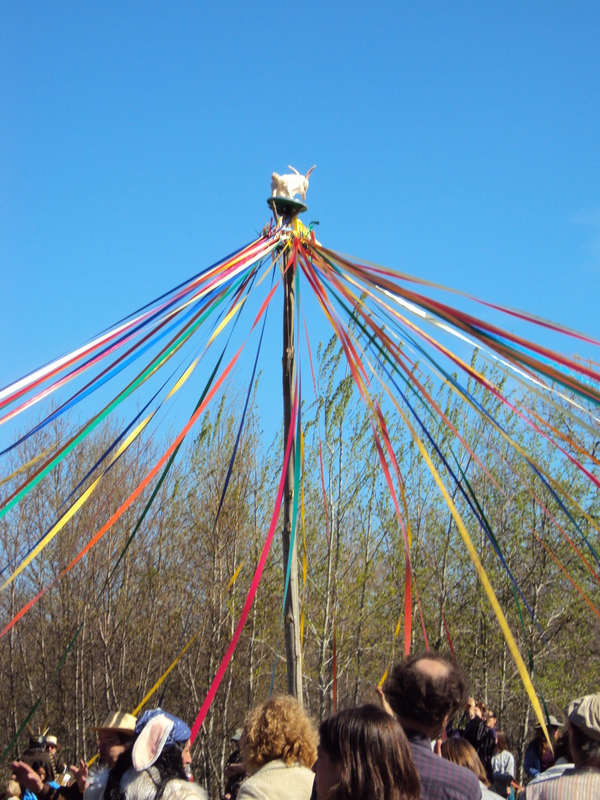 Read it all here,–The May Pole of Merry Mount, by Nathaniel Hawthorne. And as history is stranger than fiction, here’s one link to that renegade ‘English priest’, Thomas Morton, founder of New Caanan. If the Puritans had followed Morton’s lead and made peace with the Native people, what new path might our country have taken?